I don't know what it is these days, but apparently I'm into the whole wheel/pie chart concept. 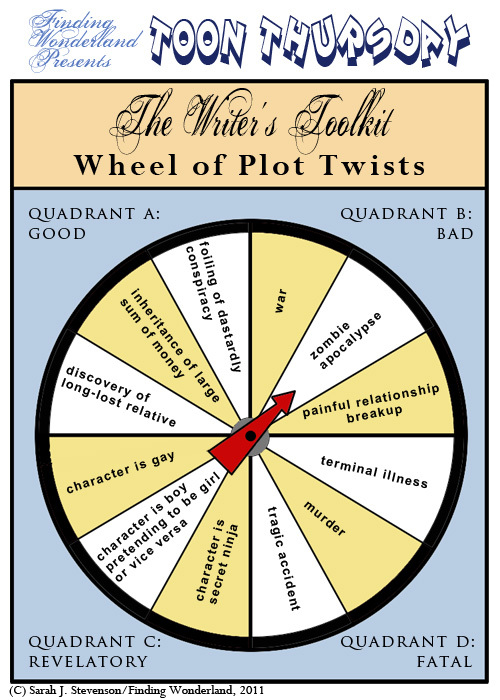 Two weeks ago was the Query Letter Wheel of Misfortune; this time, something that pretends to be a bit more helpful if you're lacking in inspiration. And if you find that the artwork looks suspiciously similar to the previous toon...uh...all I can say is, uh....Reduce, Reuse, Recycle? Before I sign off, please go visit Guys Lit Wire and contribute to the Holiday Book Fair, a drive to get 300 more books for the Ballou High School library in D.C. We're trying to make it so their library at least meets, if not exceeds, the ALA recommended minimum number of books per student. They started the year at LESS THAN ONE book per student; thanks to GLW's earlier book fair, they now have four. Help them take it to eleven! Books, that is. Personally, I keep hoping to wake up and find that *I* am a secret ninja. New and Upcoming Releases Shout-Out! Call for Submission, Scary, Scary Booklists, etc.